The 7th annual NYC Hot Sauce Expo hits the Brooklyn Expo Center on April 13 and 14 and is brought to you by High River Sauces. 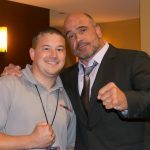 MyMMANews.com is giving away eight tickets to the event, two pairs of general admission tickets per day. General Admission Ticket includes FREE tastings from all of the hot sauce vendors and to the Stage of Doom scheduled events. Enjoy the best food vendors serving up the spiciest creations with plenty of craft beers and specialty cocktails. For more information on the event or to purchase tickets visit NYCHotSauceExpo.com.